Many of the parasites, bacteria and viruses that result in symptoms of stomach flu come from eating bad food. This means that many of the times you have these symptoms, it is from something you ate that was contaminated. But, how can you tell the difference between food poisoning vs flu (stomach flu)? Food Poisoning vs. Stomach Flu: What're the Similarities and Differences? Food poisoning and the flu have similar symptoms, which make it challenging to identify the difference between the two. However, they are still different conditions that have many differences. You usually begin to get these symptoms within a few hours of eating food that has become contaminated. Some food poisoning symptoms take longer—up to several days or weeks after eating the bad food. The symptoms usually last a few hours but can also last as many as several days. When comparing food poisoning vs flu, you need to know that the two diseases have very similar symptoms. These include having nausea, vomiting, abdominal pains, abdominal cramps, and diarrhea. The symptoms usually last about one day and then you begin to feel better. Less than two percent of flu sufferers ever need to be hospitalized in the US, although it can be a major cause of death in people who live within developing countries. The main cause of food poisoning is eating food that is contaminated with bacteria or viruses. The main bacteria include Staphylococcus aureus, Salmonella, and Shigella species. Rarely, viruses can contaminate food, but most of the time, it is due to one of the pathogenic bacteria described above. Causes of the flu include infections from bacteria and viruses that inflame the tissues of the gastrointestinal tract. The infections result in an increase in the fluid in the colon and small intestines because the tissues don't absorb water normally and the motility of the food you eat increases, resulting in diarrhea. The infection can be caused directly from the infectious agent itself or from toxins produced by the infectious agent. The mainstay of treatment for food poisoning is to avoid eating solid foods if you are feeling nauseous or having diarrhea and to drink plenty of clear liquids to prevent dehydration. The BRAT diet consists of bananas, rice, applesauce, and toast, which are the first solid foods you should eat after most of the symptoms have gone away. You should wait until the nausea resolves before trying to eat other solid foods. Medications for nausea can be given but you shouldn't take anything for the diarrhea because you need to flush out the bacteria causing the infection. When talking about treatment for food poisoning vs flu, you should know there are still some similar ways. You need to rest and drink as much clear liquids you can tolerate if suffering from stomach flu. Water is a good choice as well as chicken or beef broth, which can keep you hydrated until the infection resolves. You can take fluid replacements that contain electrolytes, such as Gatorade or PowerAde, for both food poisoning and flu. This prevents fluid and electrolyte disturbances from occurring. See your doctor if you have any evidence of dehydration or can't keep anything down because you might need a brief hospitalization for intravenous fluids. You can prevent food poisoning if you consistently wash your hands before handling food during the food preparation process. You should also avoid eating any food that smells bad or has obvious discoloration, indicating that in might be contaminated. Blood in the stool or vomit. 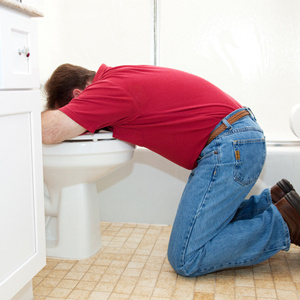 Frequent vomiting episodes with an inability to keep food or liquid down. Diarrhea that lasts longer than three days. Evidence of dehydration, such as dry mouth, excessive thirst, a lack of adequate urination, lightheadedness, or dizziness. Like food poisoning, nothing prevents the stomach flu better than good hand washing techniques for stomach flu. Wash your hands frequently and stay away from anyone who seems to have the flu. Make sure you wash your hands after using the restroom and when you need to come in contact with someone who has infected with it. However, when comparing food poisoning vs flu, you should know the flu can be contagious from a few days to even weeks. So don't share utensils or glasses with anyone who may be sick with the stomach flu. If you have the stomach flu, stay away from others who may be susceptible to the flu, such as young children, pregnant women, etc. How Can You Know Whether Chicken Goes Bad? Does Ginger Ale Help Nausea?